Webster Fort Leavenworth had their holiday celebration at a place where Abraham Lincoln once stood. 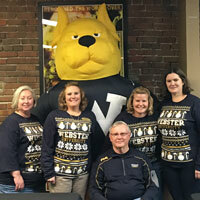 Webster University community members at Fort Leavenworth -- one of the most historic military locations in Webster's campus network -- celebrated the holidays at a site steeped in history. All students, faculty and staff members were invited to bring their families for a fun night of great food and celebration at Grinders High Noon Saloon. The spot has an interesting backstory: The three-story, historic building was built just after the Civil War as part of the Great Western Manufacturing Company complex. Cast iron stoves were built here and sold to pioneer families heading west. Remnants of the 19th century factory equipment can be found on all three levels of the grand old building. Reportedly, in its prior location the well-worn brass rail was touched by history. President Abraham Lincoln was said to have rested his presidential foot on this same rail. The historic Fort Leavenworth is the oldest continuously operating military installation west of the Mississippi River. Sometimes referred to as the “intellectual center of the Army,” it is a hub for advanced education for members of all the services as well as military officers from around the world. The CGSC located there educates, trains and develops leaders in a joint, inter-agency, inter-governmental, and multinational operational environment. Many pursue this training while also pursuing their degrees at Webster University’s location there.